Patellar luxation is very common in small dogs. This is an inherited trait, in that the conformation of the rear legs cause this condition. Bowed legs in small breeds cause an inward pulling of the patella (knee cap) that results in the patella riding to the inside out of the femoral groove. This condition can cause arthritis if left untreated. The surgery to correct this condition involves several steps and is very successful in correcting the condition. We perform a femoral trochleoplasty, which is a deepening of the femoral groove the patella should ride in. The tibial crest which is the insertion point of the patellar ligament is transposed slightly to the outside to redirect the patella path more to the outside, so it will remain in the femoral groove. Finally, soft tissue reconstruction surrounding the knee cap to loosen the side toward which the patella is riding and tighten the opposite side called imbrication is done. 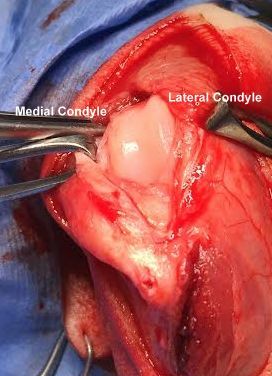 Medial dislocated patella has worn down the medial femoral condyle.